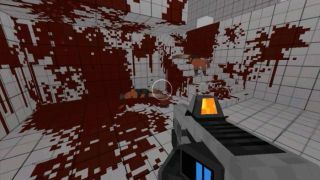 Yesterday it looked like Strafe might not hit its Kickstarter goal, despite a heart-wrenching '90s nostalgia campaign and a playable (if ropey) alpha demo. Here we are though, roughly 14 hours from the end of the campaign, and Pixel Titans has exceeded its asking price by nearly 15 grand. While the studio will hopefully continue to rake in dollars on its Kickstarter, once that's over there will be a number of stretch goals to fund on the game's official website. These come in the form of a much requested cooperative mode for $250,000, and mod support if the game hits $325,000. Which is all good news, because the procedurally generated shooter is right up my alley, and 4,000 odd other folk appear to feel the same way. The new trailer above celebrates in typically garish style, proving once and for all that dubstep, guns, dollar bills and wanton violence continue to be the core components of any successful shooter marketing campaign. Game shows too, apparently.